art. craft. design. handbags. creativity. inspiration. and maybe some other things. I’m a Nebraska Husker fan. Fortunately, the fashion world (via net-a-porter) agrees that RED is the “it color” for the season. 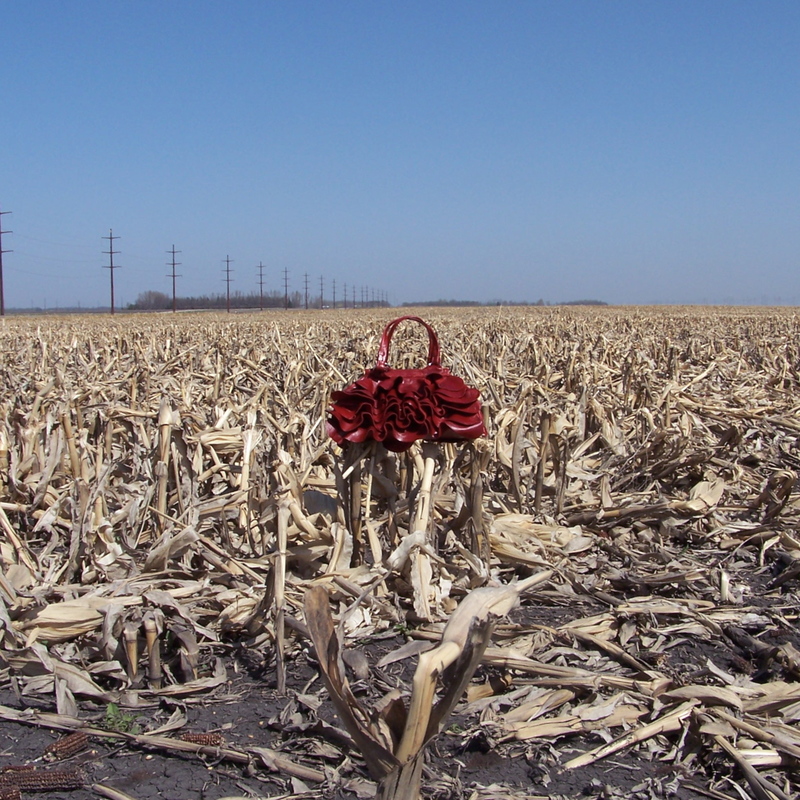 My red crinkle trap bag is the perfect piece to welcome fall, don’t you think? I’ve been collecting crochet work for years… last winter I starched some of the doilies from my collection and suspended them in the window to create snowflakes. My grandma taught me to crochet but my ability is limited to the chain stitch. I had to share some wonderful examples of some amazing contemporary crochet work. And these rocks covered in doilies at knitalette on Etsy: They’d be so cute lined up on our fireplace mantle in the living room! This list was shared via “Crafting an MBA” blog… I plan to spend some time perusing it this weekend. Should be fun! 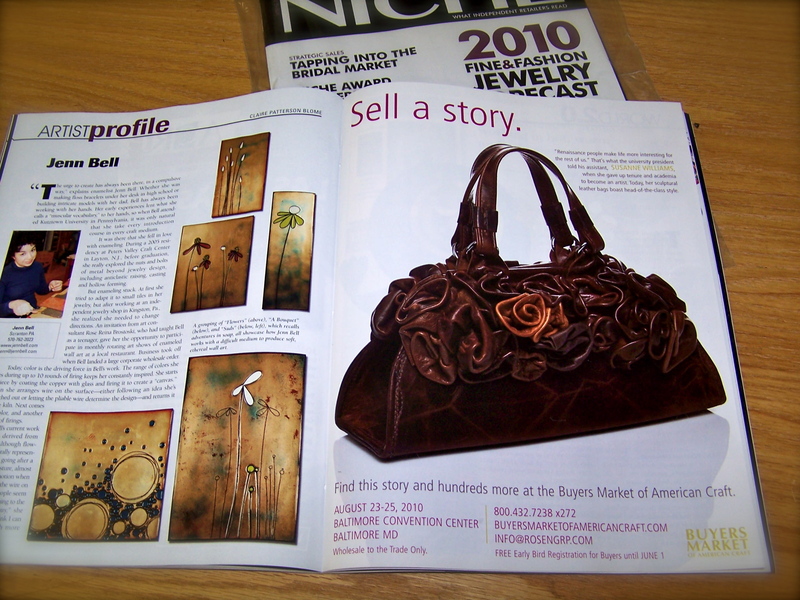 The current issue of NICHE Magazine arrived this week…and they included my story/image of my work (part of the Sell a story campaign) as a full page ad to promote the upcoming Buyers Market of American Craft! I’m thrilled!! Thank you NICHE Magazine! The summer show for Buyers Market of American Craft is August 23-25, 2010 at the Baltimore Convention Center. “1) There are clear goals every step of the way … in flow we always know what needs to be done. 2) There is immediate feedback to one’s actions … in a flow experience we know how well we are doing. 3) There is a balance between challenges and skills … in flow, we feel that our abilities are well matched to the opportunities for action. 4) Action and awareness are merged … in flow, our concentration is focused on what we do. 5) Distractions are excluded from consciousness … Flow is the result of intense concentration on the present, which reliees us of the usual fears that cause depression and anxiety in everyday life. 6) There is no worry of failure. While in flow, we are too involved to be concerned with failure. 7) Self-consciousness disappears. In flow, we are too involved in what we are doing to care about protecting the ego. 8. The sense of time becomes distorted. Generally in flow we forget time, and hour may pass by in what seem like a few minutes. May we always be so fortunate to find flow in our lives! One of my favorite books is Art and Fear: Observations on the Perils (and Rewards) of Art Making by David Bayles and Ted Orland. I’ve owned my copy for at least 10 years…it’s now dog-eared, and marked with my notes and underlines. You’ll surely find yourself doing the same. Bayles and Orland help us understand how we get distracted from — or completely quit — making art. Whether art-making, for you, is painting, sculpting, weaving, sewing, beading, etching, (you get the idea), all of us have experienced the mind games that go along with being creative individuals. We literally talk ourselves out of making our art. It isn’t good enough. The critics (jurors, buyers, public, reviewers, etc.) don’t understand your work. You can’t make money making art. Because nobody out there gets it. Or you need to make art on the side, while you work full-time at a “real” job. Being an artist isn’t a “real” job. My needs to be perfect. It isn’t perfect enough. You get the idea. “In the end it all comes down to this: you have a choice (or more accurately a rolling tangle of choices) between giving your work your best shot and risking that it will not make you happy, or not giving it your best shot — and thereby guaranteeing that it will not make you happy. It becomes a choice between certainty and uncertainty. And curiously, uncertainty is the comforting choice” (p. 118).